Despite being open since 1960, the Two Red Shoes Ballroom would be just another forgotten dance hall had it not been for one event: the dance on Thursday, January 3rd 1963. 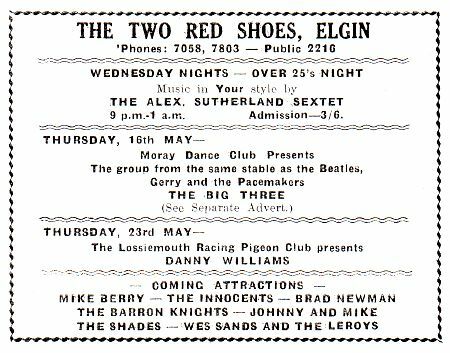 The Northern Scot, which carried weekly adverts for the venue never even mentioned who was playing that night. The advert seen below came from the Elgin Courant. 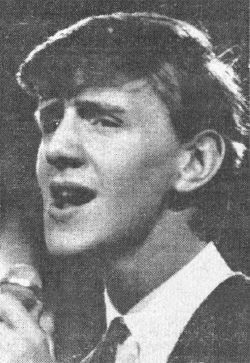 Promoter Albert Bonici must have assumed that while no-one would have heard of the group booked for that night, people might be aware of the single that was climbing the chart at the time, hence his describing them as the “Love Me Do Boys”. 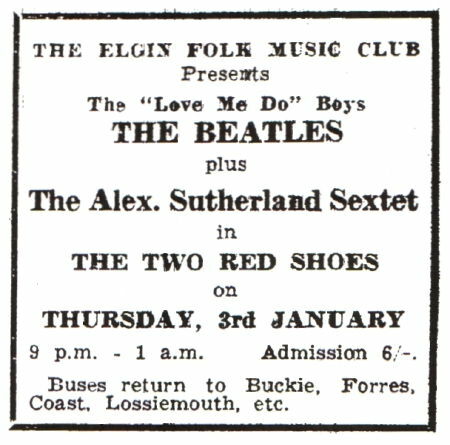 The next few years would see the Two Red Shoes become one of the best known venues in Scotland playing host to some of the most famous names in British pop and rock but by the end of 1966 the magic started to disappear. 1967 saw only a few big names but it did include one of the biggest in the history of rock music – Pink Floyd. It doesn’t detract from what took place in this small dance hall and the music that was played here. So, take some time to browse the years, watch the clips and hopefully relive some happy memories. If you want, share them with everyone. 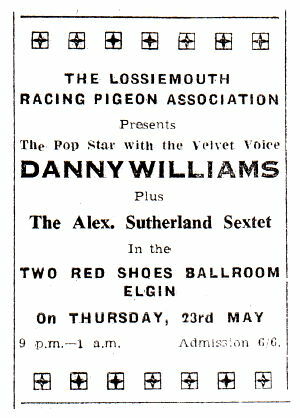 May 23 – Lossiemouth Racing Pigeon Club presents Danny Williams plus The Alex. Sutherland Sextet. It wasn’t uncommon for Albert Bonici to place two adverts in the papers for the same event. The two above come from the Elgin Courant. What surprises me is that no-one bothered to check and see that on one it’s the Racing Pigeon Club while the other has it listed as association. What on earth was going on? June 20 – The Elgin Folk Music Club present Eden Kane‘s younger brother Wes Sands plus The Le Roys plus The Alex. Sutherland Sextet. 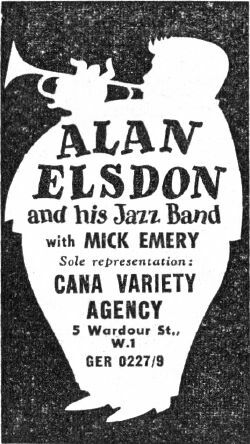 Wes Sands was in reality Clive Sarstedt, who was managed by the legendary Joe Meek. Despite being in the business at this time, it would take him another 13 years to get into the charts as a one-hit wonder. In 1976, using his middle name of Robin he eventually made it with a cover of the old Hoagy Carmichael hit, “My Resistance Is Low”. July 04 – The Scottish Jazz Promoters Association presents Don Spencer plus Fireball XL5 plus The Alex. Sutherland Sextet. While the advert clearly states Fireball XL5, I doubt there was such a band. Don Spencer hit the U.K. charts in March with a song called “Fireball” which was used as the theme for Gerry Anderson’s hit TV series, “Fireball XL5”. Here it is in all it’s glory. Spencer would later make his name as Australia’s favourite children’s TV entertainer and found the Australian Children’s Music Foundation. He also happen’s to be Russell Crowe’s father-in-law! October 14 – The Scottish Promters Association presents Elgin Holiday Dance with Eddie Le Pard And His Leopards. As from Tuesday, 15th October, the newly formned Eddie And His Leopards will be playing as guest stars each Tuesday night. 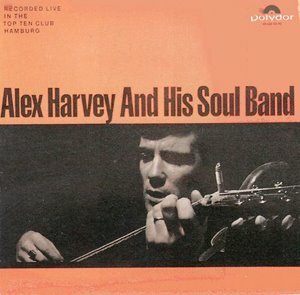 October 31 – The Elgin Folk Music Club presents The Alex Harvey Big Soul Band plus The Alex. Sutherland Sextet. The album above was recorded around this time but released in 1964. It’s the only record of Alex and his band from this time. I’ve found a free download of the whole album that you’ll get by clicking this link. © Copyright 2008 Roy Deane, Rockmine Archives. All rights reserved. No part of this web site may be copied, redistributed, broadcast or published in any form without approval. © Copyright 2008-2010. Roy Deane, Rockmine Archives. All rights reserved. No part of this web site may be copied, redistributed, broadcast or published in any form without approval.